Summertime in Niagara is the best. No matter where you go, there are fruit stands lining the streets with baskets full of freshly-picked produce. There’s pretty much a farmers market going on everyday somewhere in the region, and if you’re lucky, maybe even your next door neighbour has their own little patch growing and they’re willing to share! We could go on and on, but you can find a complete list of pretty much all the farms in Ontario here. Needless to say, when it comes to fresh fruits and vegetables, we’ve got a huge selection here in Niagara! Another reason why summer is the best time of the year! 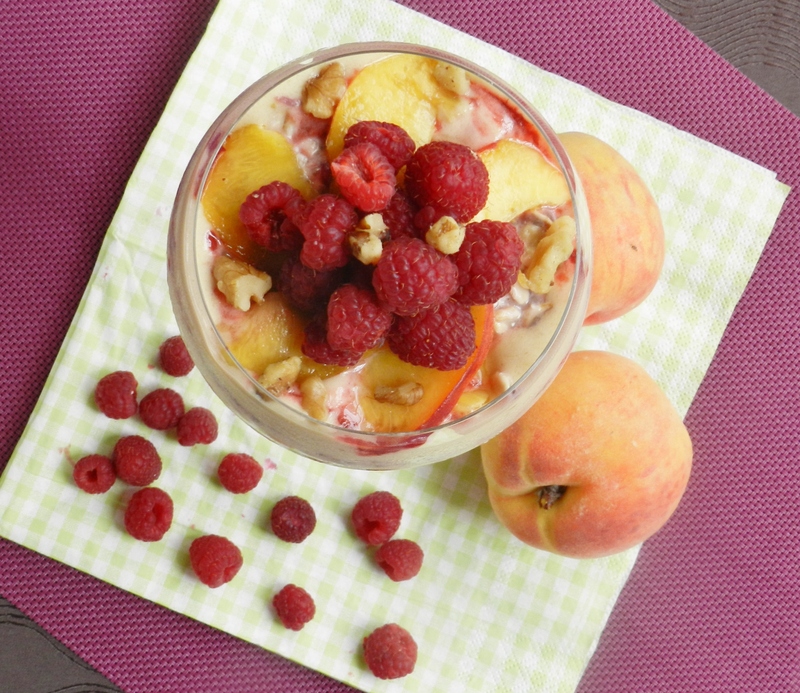 And what better way to showcase perfectly ripe, fresh fruit than in a breakfast parfait? No tampering, just letting their freshness shine through. This particular parfait was fashioned after Angela’s creations. 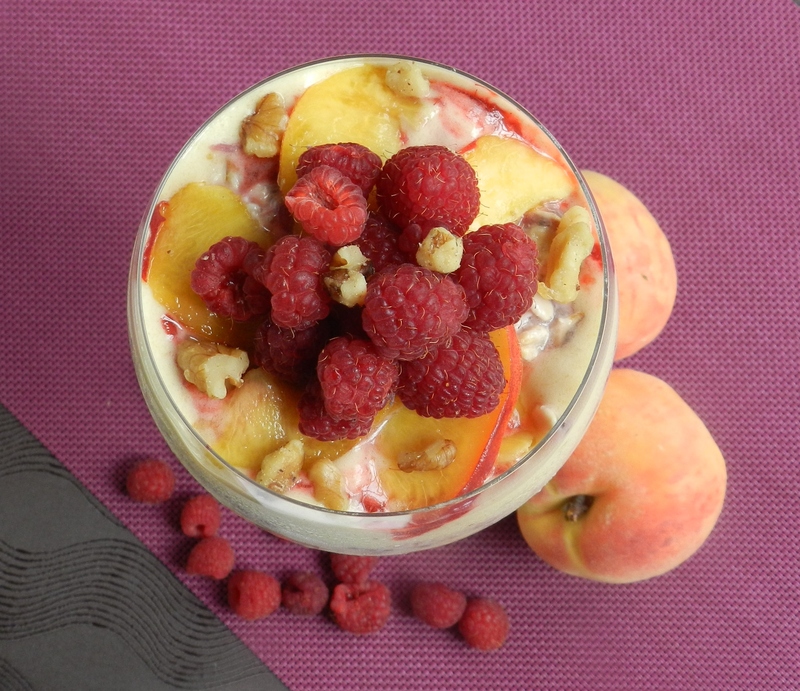 The oats are flavoured with fresh raspberries and our raspberry coconut jam, and it’s layered with peach-banana soft serve. We’ve done several parfaits before, some layered with tofu mousse, some with yogurt, but layering with banana soft serve has got to be our favourite way to have a breakfast parfait! The ice cream-like consistency gives the parfait a dessert-like quality, and who doesn’t want dessert for breakfast? Just look at all that fruit! Nothing beats fresh-picked fruit. Nothing. Sometimes in the middle of winter we think we trick ourselves into thinking that the berries that we’re buying at the grocery store are really fresh tasting and have a ton of flavour, but then summer comes, and we wonder why we even bothered wasting our money! The night before, combine all oat ingredients, cover and place in the fridge. 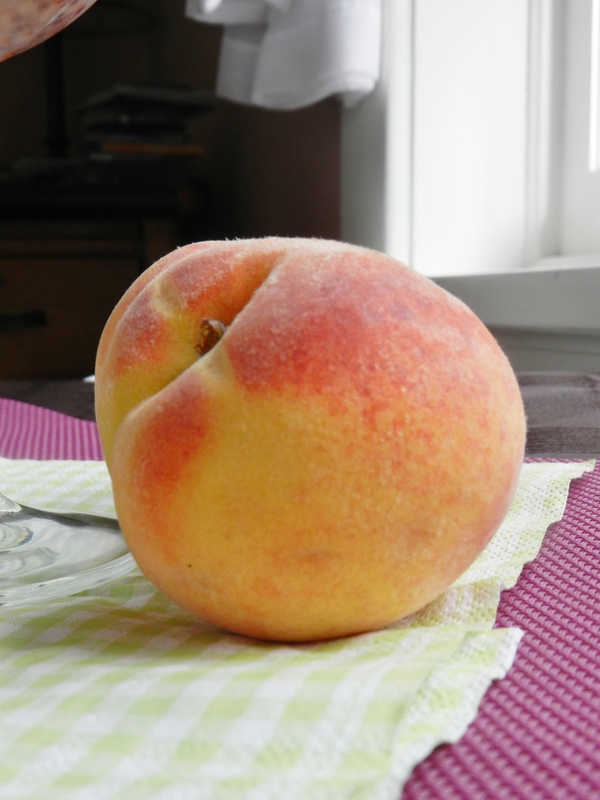 In the morning, place frozen peach and banana in the food processor and blend until smooth. In a glass or jar, place a few spoonfuls of the oat mixture. 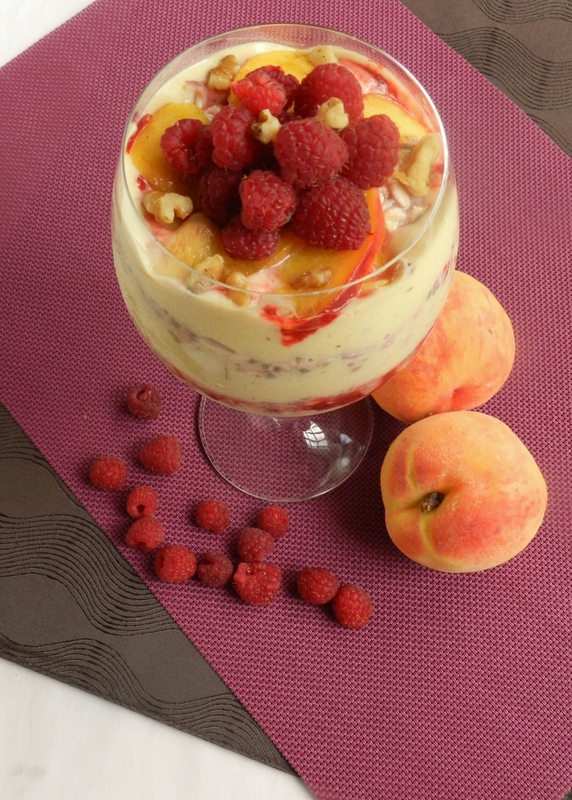 Top with a few spoonfuls of the soft serve, more diced peaches and/or raspberries, and more jam. Repeat this process until you run out of everything. 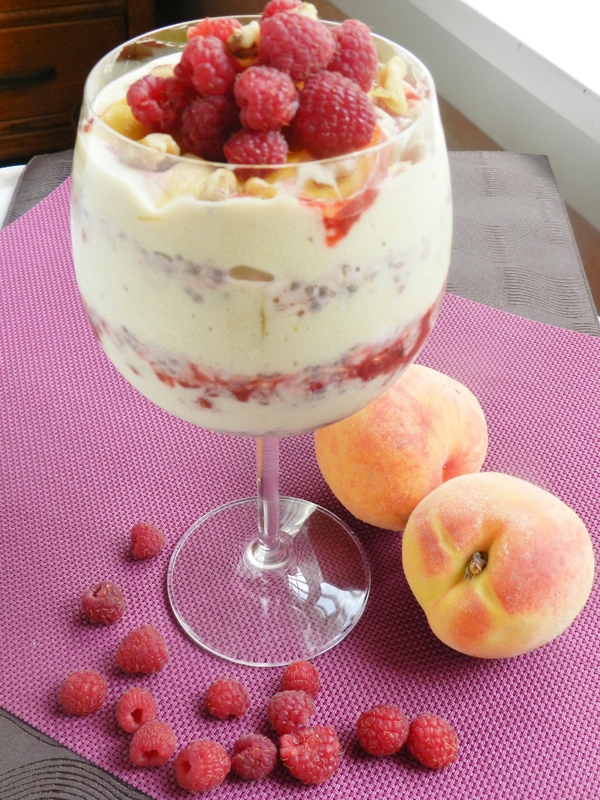 Top with additional fruit, nuts, yogurt, etc. if desired. Have you ever visited the Ontario Green Belt in the Summer before? Posted in Uncategorized and tagged Angel's Place, breakfast, Cherry Avenue Farms, fruit, Green Mountain Farm, healthy, Howell Pumpkin Farm, Kar-Dean Fruit Farms, Lake Land Meats and Farm Market, Lincoln Line Orchards, Meyer Farms, Murphy's Country Produce, niagara, no-bake, Nokara Farms, parfait, Peach Country Farm Market, Puddicombe Farms, Quiet Acres, Richardson's Farm and Market, soft serve, Sunnybrook Farms, Thiessen Farms, Tigchelaar Berry Farms, Warner's Farm, White Meadows Farms, Whitty Farms. Bookmark the permalink.